Spaghetti and meatballs is certainly the most well-known Italian dish, at least in the U.S., but most of us have not even tried to make the dish. And yet, it is always a real hit with the fans, especially this recipe, which is incredibly tasty. After a recent dinner party, a friend announced to the table that these were the best meatballs she had ever tasted. There are three components to this dish – the pasta, which should be regular, high quality spaghetti, the sauce, which can be made in a couple of ways depending on the season, and the meatballs, which can be made with a variety of meats. If tomatoes are out of season, use two 28-oz. cans of imported Italian plum tomatoes. You can use local U.S. brands, but the Italian climate really produces the best tomatoes. Roughly chop the tomatoes and use the juice. Yes, I know that Herbs de Proveñce are French and not Italian, but it really works, so get over it. Put all of the ingredients in the largest sauté pan that you have. You want something with a big surface area. Cook uncovered at a low simmer for about 45 minutes or until the tomatoes are fully cooked and the sauce has reduced a little. 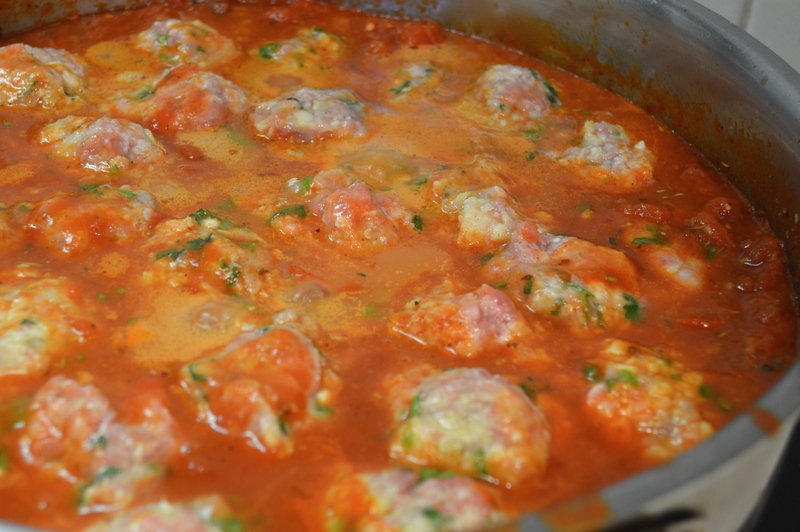 There are a number of options in terms of the meat to use for meatballs. Marcella Hazan says to use equal parts of ground beef and ground pork. Some just use ground beef. My preference is ground veal. For some reason, this produces an incredibly light and tasty meatball. 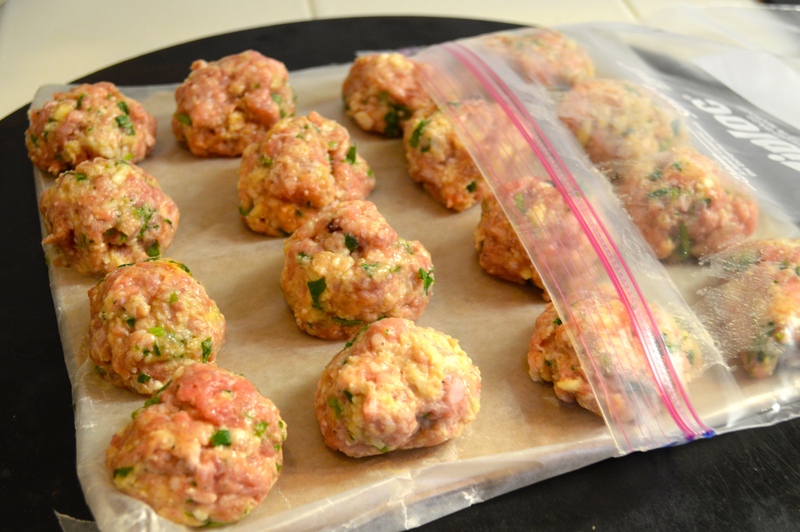 The rule of thumb is that it takes a pound of meat to make 24 meatballs. Combine that with a pound of pasta and you have dinner for six. For the math challenged, that’s four meatballs for each person. Making meatballs takes a little time, so I like to double the recipe, or even triple it, and freeze the extra meatballs. In this way, the next time I get the urge for spaghetti and meatballs, I have a little less work. Or, if I get the urge for a meatball sandwich, I can respond quickly. A little tip on freezing the extra meatballs: Fold some aluminum foil so that it is a double layer “pan” about the size of a gallon zip-lock. You can get about 25 meatballs on the pan, which you gently slide into the zip-lock. This makes it easier to make sure that the meatballs freeze while separated. The breadcrumbs are the key to this dish, so don’t take shortcuts and use some pre-packaged stuff filled with presevatives and chemicals you can’t pronounce. Follow the instructions below. Put the breadcrumbs in a bowl and add the milk. Mix and let sit for 15 minutes. While resting, make garlic bread with the remaining baguette – see below. In another large mixing bowl, whisk the eggs and add the salt, pepper, garlic, parsley and cheese. Mix well. Add the veal and the breadcrumbs and gently mix everything together with your hands. Now put the meatball concoction into the fridge for 30 minutes. It needs to chill so that it is easier to work. When ready to start making the meatballs, bring the sauce to a slow simmer and start making meatballs about the size of golf ball size, which you will add directly to the sauce. Make about 24 meatballs. Note: We don’t brown the meatballs! Cover and gently simmer for 25 minutes. While the meatballs are cooking, start cooking the spaghetti, put the garlic bread in the oven and finish making meatballs for freezing if you doubled the recipe. Serve and watch the crowd go wild and gobble up every smidgen. Garlic bread seems to go well with spaghetti and meatballs, and you should have ¾ of a baguette leftover. My favorite technique is to slice the bread almost all the way through, insert a thin pat of butter between each slice with a little garlic salt, wrap in foil and bake at 350 degrees for 20 minutes. If you don’t want garlic bread, save the baguette until morning and use our recipe to make Pan Perdu, or, as we call it, French Toast. great recipe. I’ll make it. We just got back from Italy. Had a blast in Venice, Florence, Rome and Milan. We were there when George Clooney got married and didn’t get an invite. Hope you and Barbara are doing well. Spaghetti & meatballs is an American dish, not an Italian dish. As Marcella Hazan said, if you were looking for spaghetti & meatballs in Italy, you would need to go to an American restaurant to get it.